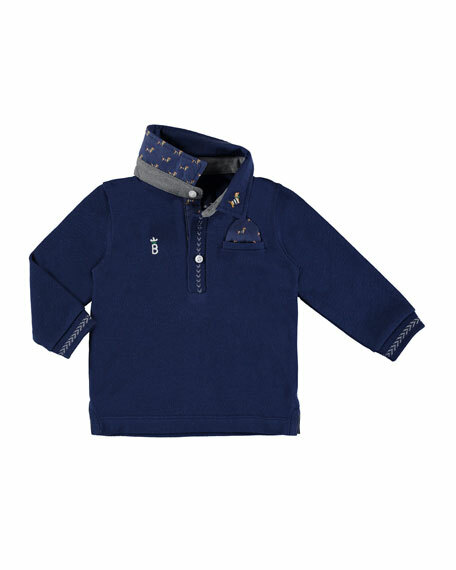 Mayoral polo shirt featuring embroidered dog detail at collar tips and back; dog-print underside. Herringbone detail at cuffs and placket. Logo embroidery at right chest. For in-store inquiries, use sku #2276342. 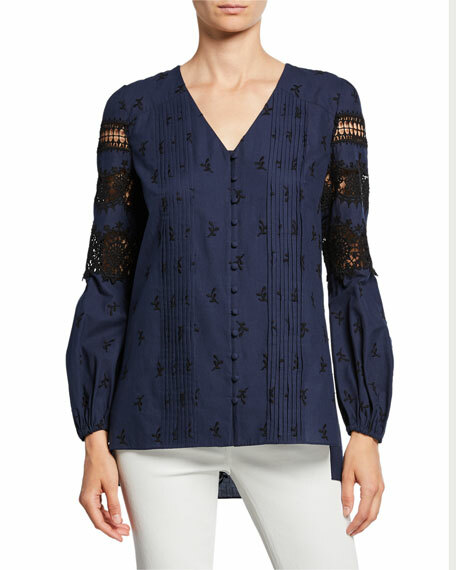 Elie Tahari "Leigha" cotton blouse with lace insets and embroidered details. V-neckline; button front. Long poet sleeves. Vertical pleating down front. Inverted back pleat. Relaxed silhouette. High-low hem. Cotton. Dry clean. Imported. Florence Eiseman three-piece outfit set. Long-sleeve polo top with contrast tipping. Spread collar with button placket. 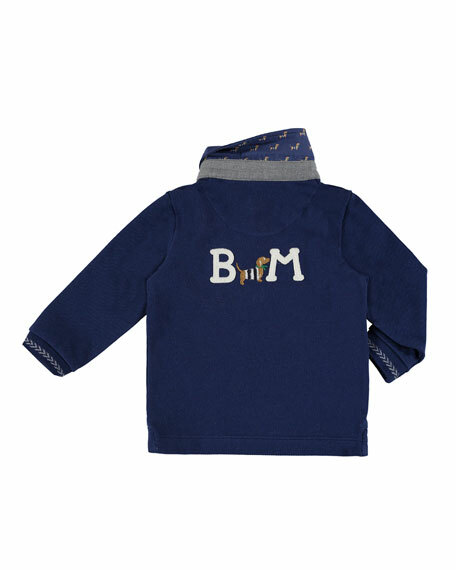 Knit cardigan sweater with bear embroidery. V neckline; button front. Tartan plaid pants. Pants and cardigan: polyester/viscose. Polo shirt: cotton. Imported. 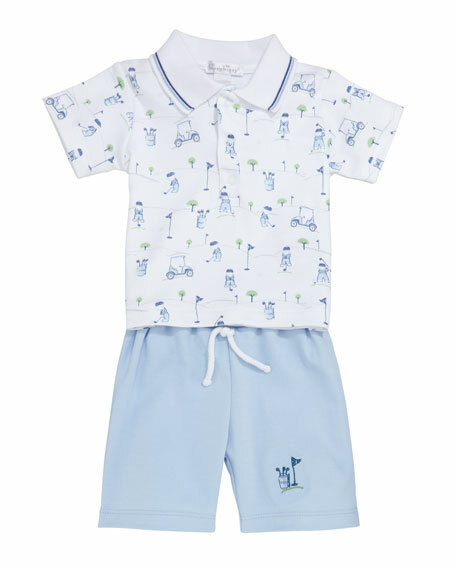 Kissy Kissy two-piece outfit set from the First Tee collection. Printed short-sleeve polo shirt. Ribbed spread collar with striped tipping. Snap placket front. 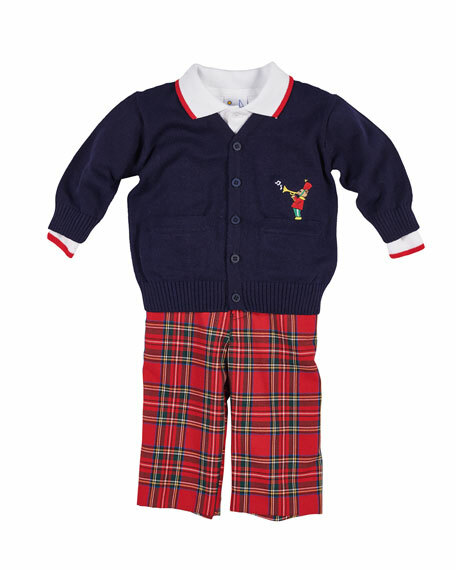 Includes drawstring Bermuda shorts. Gold embroidery at left leg. Pima cotton. Made in Peru.